St. John’s CDC advisory committee met recently to evaluate goals and establish new goals for 2019. The committee agreed that they want to continue to focus on the mind, body and spiritual health of the children and the staff of St. John’s CDC. Pastor Laura will be working closely with the staff to implement the Orange Curriculum in their classrooms. Orange is anchored in teaching children the stories of the Bible in a real, relational, and fun way. Pastor Laura will also be available to the staff for spiritual guidance. The advisory committee and the CDC staff wish to strive to serve healthier snacks and meals to our CDC children. We will be looking at Healthy Rowan’s nutrition guidelines and the organization GO NAPSACC to improve our practices in the area of healthy eating. The CDC playground committee has submitted an application to N.C. State’s College of Design. Once our application has been accepted, N.C. State will proceed to design an Early Childhood Outdoor Learning Environment. This new initiative’s objective will be to support young children’s healthy, active lifestyles while learning through nature. We are anxiously awaiting approval from the university. In preparation for our new playground, Courtney Bost, CDC Director, has enrolled in NC State’s Early Childhood Outdoor Learning Environments Certificate Program. There are many who care deeply about our CDC and are committed to promoting the nurturing of our children spiritually, intellectually, emotionally and physically each and every day. Kristy King is in her 11th year with St. John’s CDC. She believes in providing quality childcare to our children. When she began with the CDC, she was a teacher in a three-year-old classroom. Later, Kristy moved into a four-year-old class, and now serves as part of the administrative team as Program Coordinator. As our Program Coordinator, Kristy works with the teachers to implement their lesson plans, prepares staff schedules, and works to enhance the CDC’s Creative Curriculum with hands on activities. Kristy really enjoys having the opportunity to share her creativity with other co-workers. 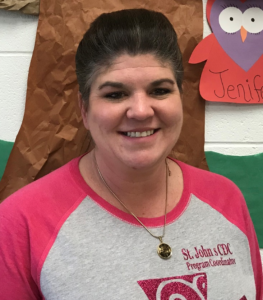 She credits working with a great staff and her love for the children as the reasons she has remained with St. John’s for over 10 years. Thank you Kristy for the love, joy and talent you bring to St. John’s CDC!